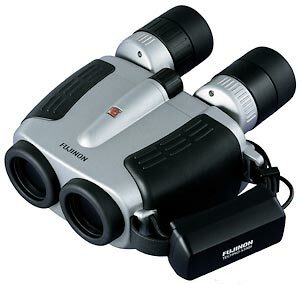 Fujinon Techno-Stabi Binoculars - Are they for You? 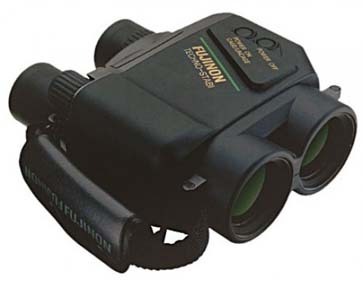 The Fujinon Techno-Stabi binocular is the company's image stabilized binocular and is available in two readily available configurations: the 12X32 and the 14X40. A definite plus for the Techno-Stabi is that it uses gimbal-mounts for stabilizing its prisms as compared to Canon's approach to image stabilization. The result is that the Fujinon image retains its image/view when used on an unsteady platform, such as is encountered when on a boat, train, plane, coach or recreational vehicle, car, or even from the back of a camel. The Canon Image Stabilized binocular does better with much smaller movements, such as hand tremors, and appears to be optimized for that type of movement. We have found that the stabilized Fujinon Techno-Stabi retains a sharpness of image that Canon's Image Stabilized can lose when the image stabilization feature is engaged. Typically, the higher powered Canon instruments seem to slightly defocus or shift between a focused and a softer image (some less than others) when the stabilization is turned on. The basis for Fujinon Techno-Stabi's stabilization is two piezo gyro vibration sensors (one each for vertical and horizontal axes) for detecting repetitive and/or cyclical movements. To detect binocular direction, it uses another pair of gyro sensors (again, one each for vertical and horizontal axes). A microprocessor then takes the inputs from these sensors and controls direct drive motors to instantaneously provide correcting movements to the prisms mounted in a dual-gimbaled frame. It is an innovative approach that seems effective. Is image stabilization technology in binoculars worth the increased weight and bulk? Ask anyone who has used image stabilized binoculars. Typically, when someone who has an image stabilized binocular buys a new one it is likely to be another image stabilized instrument. This binocular genre has a strong and loyal following. If you have opportunity to try a friend's or to check the view through a demo model at a store, by all means do what you can to get a hands-on peek through them! You'll be able to read at a distance with Fujinon Techno-Stabi binoculars. With a Zeiss 15X45, for example, we've always had to brace on or against something solid to quiet the jiggles that make it impossible to read signs at a distance. With the Fujinon Techno-Stabi those annoying jiggles are stabilized for you and it's amazingly easy to read at a distance. If you're concerned about losing image stability as you rapidly track something moving quickly like a plane, bird, deer, jet ski, or motorcycle, for example, we found that the stabilization feature will not fail you there nor when you quickly change the elevation (up or down aspect) of your view. The Fujinon Techno-Stabi stabilization range for the 12X32 is three degrees and the 14X40 is five degrees (Canon Image Stabilized binoculars stabilize 0.07 degrees, which more or less limits them to non-vehicle use) - which means that for most uses the 14X40 would be preferable as it would compensate for larger movements. We've found that the 14X40 will provide a well-stabilized image for most boat/ship situations as well as movements in small aircraft, which are more prone to being buffeted about than larger planes, and vehicles on most road surfaces. The image stabilization aspect of the binoculars does make a high-pitched motor sound that varies when it is doing its magic. The Fujinon Techno-Stabi uses two AA batteries for the 12X32 configuration and four in the 14X40 instruments. The batteries fit into the hand grip of the 12X32 model and go on the underside of the larger models (with a cover that fits over them). If you don't use the image stabilization feature for a minute, it automatically shuts off to extend battery life. The battery charge is monitored by a small LED indicator which is green while the power is adequate, turning red when you need to start looking for the extra batteries. Although Techno-Stabi literature says batteries will only last for 3 hours of continuous use, we estimate that alkaline batteries should last about 4-5 hours or more with the image stabilization periodically engaged and around 30 hours in standby mode. The operating temperature range is from 14-122 degrees F or -10 to +50 degrees C. Probably the main thing affecting this range is the functionality of the instrument's lubricants at the varying temperatures. We think that the Techno-Stabi binoculars will be ideal for a number of applications. With the company's background in producing marine optics, it seems likely that it had boats and ships in mind when it designed them since a chop or heavy sea conditions can make non-image stabilized binoculars quite difficult to use. The Fujinon Techno-Stabi will also provide fine optics performance for hunters, birdwatchers (especially from a hide or for marshes and plains), and surveillance. We've heard that they're outstanding for sporting events and concerts, and ranchers say there's nothing like them for identifying livestock. The Techno-Stabi model has a tough polycarbonate body and is completely waterproof, is internally fog-proof, and has been purged with nitrogen gas. It has twist up/down eyecups with detents that are large enough to be nice if you're in rough conditions while using them. The relatively small exit pupils mean that you're going to need to keep the binocular's exit pupils well aligned with your eyes. There may be some activities where this will be more difficult than others, however we did not find it unbearable. You'll want to experiment with different ways of holding them under varying conditions. We found that what worked for one person didn't necessarily work for another, although it seemed as though most people found that vehicle/boat/transport vibrations were less noticeable when the instrument was held with a light grasp. Provision is made for a hand strap to be attached to the instrument. This is good and some will find it helpful, although many others will still prefer the neck strap. While a very nice instrument, it's also heavy and the larger model is probably not going to be going with you on each extended hike into the woods or fields because of its weight. We believe you'll be delighted with the Techno-Stabi's optical contrast and color fidelity. It provides a crisply contrasted image. Your view of colors will similarly be excellent with hues of color easy to see and differentiate. The image you get for the price is frankly outstanding. You'll find that the stabilized image will allow you to resolve details and see shades in color patterns that are simply not observable even with the finest handheld optics. The Techno-Stabi uses the roof prism design and its BaK-4 prisms have phase coating as you would expect in an instrument of this caliber. Its optics are fully multi-coated, as you would expect from our comments on excellent contrast and color fidelity above. You can adjust individual eye focus by +/- 4 diopters ensure good focusing. Like other image stabilized binoculars, the field of view is somewhat a bit narrower than binoculars without image stabilization. This can make "finding" a bird on the wing or other quickly moving images a bit more difficult than with a wider field of view. The Fujinon Techno-Stabi 14X40 binoculars come with a Pelican 1400 waterproof case. The case by itself retails from $60-70 or more, depending on where you shop. The case has custom-molded foam inside to keep the instrument secure and to hold the batteries which are included. A closed-cell flotation strap is included for those who may be using them near or on water. It is said to keep the binocular from sinking in water, but we haven't tested that. A rain guard for the eye pieces is included, but not caps for the objective lenses. 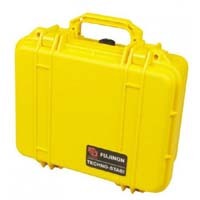 As is the case with most electronic items, the Fujinon Techno-Stabi's come with a one year warranty. An optional AC power supply and/or a 12 volt power cord is available and would likely be helpful in some instances. As is typically the case, you'll find competitive pricing and excellent customer service at Amazon.com (USA) .